Jason deCares Taylor, a British artist had a unique vision for an underwater sculpture garden. His vision included sculpting 400 life-size figures out of reef-attracting materials and placing them 30 feet deep in the sea. The garden will create spaces for new corals to grow and reef inhabitants to thrive. The sculptures were casts of real people, and their life-like presence is haunting. In addition to people, he added furniture and accessories to create contrast and interest. 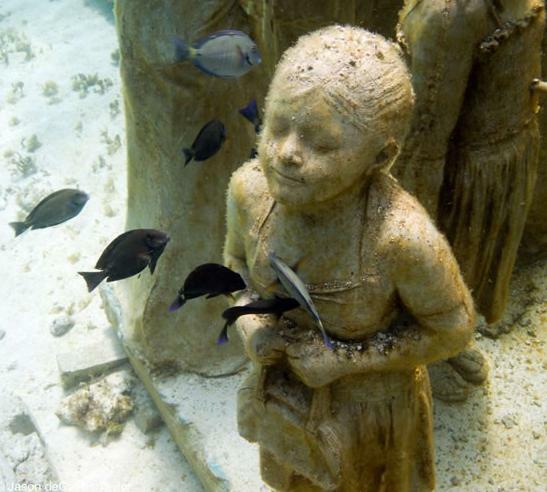 Located on the ocean floor of Mexico’s Isla Mujeres National Marine Park the garden will attract many tourists and encourage a new reef to develop in the waters near Cancun. The work of art is appropriately titled “The Silent Evolution”. This video is a great interview with the artist. Check it out and be astounded.